NETWORK FINALS: AMERICA’S GOT TALENT and CASTAWAYS gained 0.1 in final numbers, while the PALEY CENTER SALUTES THIS IS US special and the NCIS: NEW ORLEANS rerun lost the same. In addition, both CW reruns dropped 0.1, which might have been the result of a local sports preemption. CABLE HIGHLIGHTS: FX’s MAYANS MC stabilized at the top of Tuesday cable, up a tick to 0.79. USA’s WWE SMACKDOWN gained 0.06 to 0.78, and THE PURGE was down 0.02 to 0.44. MTV’s THE CHALLENGE rose 0.06 to 0.51. On TLC, SWEET HOME SEXTUPLETS debuted at 0.37, and OUTDAUGHTERED was up 0.08 to 0.36. On Comedy Central, TOSH.0 returned at 0.34, and THE JIM JEFFERIES SHOW was at 0.17. Fox News’s TUCKER CARLSON TONIGHT tied with MSNBC’s RACHEL MADDOW SHOW at 0.30 in the 18-49 demo, with CARLSON at 0.52/3.1M in other demos, and MADDOW at 0.49/3.3M, and with CNN’s ANDERSON COOPER 360 at 0.24/0.34/1.2M. TBS’s WRECKED shed 0.04 to 0.30. 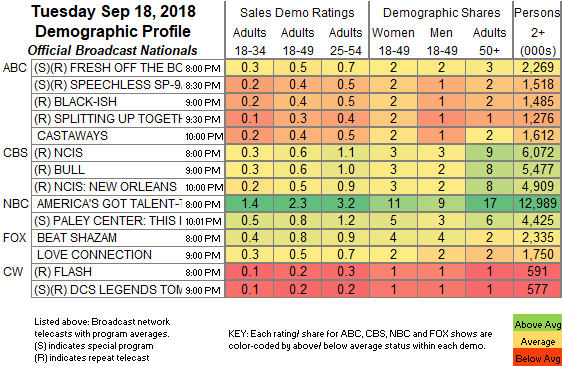 On Lifetime, MARRIED AT FIRST SIGHT climbed 0.05 to 0.30, and SEVEN YEAR SWITCH ticked down to 0.15. Nickelodeon’s 6PM LOUD HOUSE was at 0.29. Paramount’s INK MASTER edged up 0.02 to 0.29. Food Network’s CHOPPED gained 0.03 to 0.28. 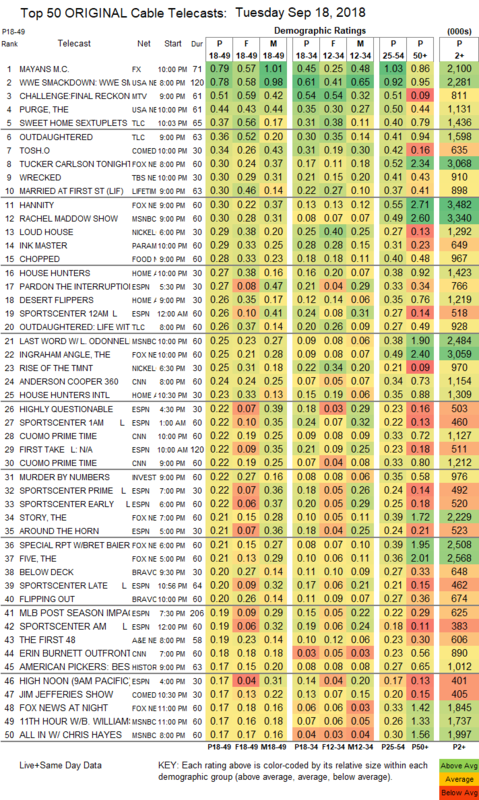 On HGTV, HOUSE HUNTERS ticked up to 0.27, DESERT FLIPPERS lost 0.02 to 0.26, and HOUSE HUNTERS INTL ticked down to 0.23. On ID, MURDER BY NUMBERS added a tick for 0.22. On Bravo, a half-hour of BELOW DECK (down 0.25 to 0.20 from last week’s hour) was the lead-in to FLIPPING OUT, which was down 0.08 to 0.20. A&E’s THE FIRST 48 ticked up to 0.19.